Perhaps the finest free range Red Stag hunting in the world, take a step back in time for a 300 class, wild, Otago Red Stag. Free range red stag hunting during the ‘roar’ is simply an amazing experience and an incredible hunt. Combine this with the Otago red deer bloodline, first class trophies of the highest echelon, 50,000 acres of private hunting with NO high fences, bush clad valleys, open tussock tops and you are in red stag heaven. Free range red stag hunts are often booked out 2 years in advance, so an early booking is essential. The quality of hunt we are offering and quality of trophy in a genuine free range stag of original Otago bloodline is unrivaled; this has led to an extremely high demand for these hunts. 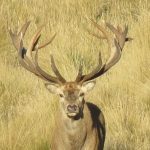 You can expect to see 300 class stags on a regular basis, your outfitter and his guides have an intimate knowledge of these free range giants and will help you secure a world class free range red stag. Free range red stag hunting is a passion for me. It’s a privilege for guide and client alike to hunt these magnificent creatures which date back to the original Morven Hills liberation of 1871. This is a free range red stag hunt and trophy with a history and a story, for further reading refer to Chris’s article ‘The Otago Red Stag’ Lake Hawea Hunting Safaris unrivalled, unparalleled, genuine free range red stag hunt for a mountain monarch – click here for The Otago Red Stag article. We only take 6 first class free range red stag trophies each season as to not encroach on younger trophy stags coming through, we place a strong emphasis on keeping the average Douglas score (used for measuring free range trophies in NZ) of these 6 trophies above 300. Trophies carry a minimum of 12 points and in some cases will reach 18 points; a beam length of around 40 inches or longer is our benchmark. We also take 2 – 3 second class free range red stag trophies each season, these hunts are available at a discounted rate. Please see our price list for all hunting rates. Free range red stag hunting is only available in March and April; best ‘roar’ dates are between March 15 and April 25.